Some people like to decorate their houses for Halloween. Other people like to transform their homes into terrifying haunted houses. A little DIYing can help you get there, whether you want to create a full-blown experience for trick-or-treaters or you're just looking to decorate a little. The more time you put into decorating for Halloween, the bigger the pay off as far as how memorable your home is to the neighbors. Explore these outrageously spooky haunted house ideas and figure out which makes the most sense for your home this year. 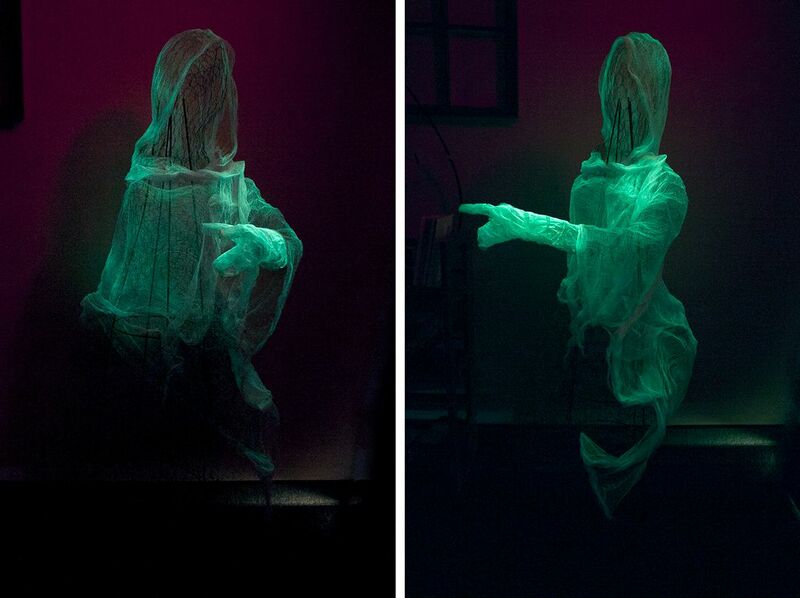 You can hang a white sheet and create a ghost, but this idea is sure to be more creepy. By using chicken wire, you can make the ghosts appear more lifelike in form. Also, opt for cheesecloth instead of sheets to make the entire project more spooky. There's nothing quite as scary as the Grim Reaper making an appearance at your haunted house. The important thing is to take your time with this tutorial and use a foam wig stand to help make the shape true to form. There's not much creepier than a bunch of ragged, destroyed dolls hanging from the ceiling with weapons and blood galore. Just make sure whichever doll you decide to destroy isn't worth a ton of money first. All you need to add some moody ambiance to your house is a wood sheet, sharpies, and some paint. For this project, the teeth have a lip that rests between two of the porch beams, so no nails were needed. If you want to add a touch of creepiness to your home's exterior but don't want to go all out, pick up a bunch of plastic skeletons and dangle them from your roof and windows. This project is an inexpensive way to add major creepy vibes to any part of your haunted house. The key is to make the shape of the bags as body-like as possible. To accomplish this, stuff actual clothing with newspaper then put your dressed body inside the trash bags. If you love sculpting with clay, try out this haunted house idea. Werewolves are a classic Halloween staple, but sometimes they can look less than scary. Learn how to make your own and it will surely look ferocious. Hang the finished piece under your front porch or just inside your home's foyer. 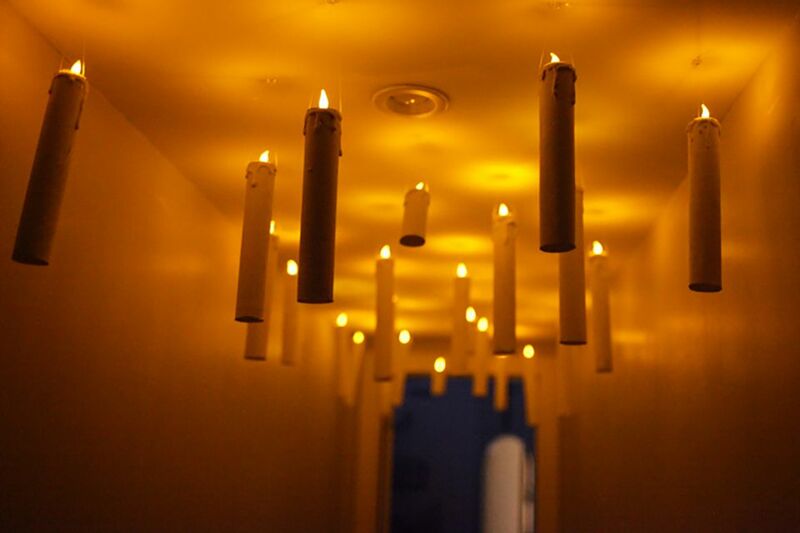 This haunted house DIY is inspired by Harry Potter, but even non-fans will be spooked when they look up and see the candles magically floating in mid-air. While you will need a ton of scary plastic jack-o'-lanterns to make this idea come to life, the end result will be totally worth it. The base of this arch is constructed out of a PVC pipe, so it's easy to customize to your specific entryway. No one wants to get caught in a spider web, especially not inside a haunted house. Learn how to weave a simple web and place them around your haunted house perimeter or to block off certain areas you don't want guests. This haunted house idea is more practical than it is scary. If you are inviting guests into your home to get spooked, make sure they wipe off their feet first. You can customize a basic black rug using white fabric paint. Take advantage of your front lawn space when setting up your haunted house. One way to do this is by littering the lawn with zombie skeletons. Craft a form out of PVC pipe, add some stained red clothing, and then put on a foam skeleton head. Signs are a great way to set the tone of your haunted house. Some haunted houses are downright scary and others might be more suitable for children. This sign works well for a more underage type haunted house. Simply find a canvas or some old boards you can stencil. If you love building things with wood, perhaps this is the perfect haunted house idea for you to try this year. The devil is in the detail on this one, so don't expect to complete this project in one sitting. To add instant haunted curb appeal to your house, make a bunch of silhouetted figures using cardboard. If you aren't good at drawing freehand, the original creator included some downloadable templates. This haunted house idea is perfect if you want to make a big impact on a very small budget. If you plan on having your haunted house party or tour inside your home, make sure that virtually everything that is on display is creepy in one way or another. You can do this in an obviously gory way, or you can opt for a more elegant yet gothic approach with these candlesticks. No detail is too small when it comes to creating an absolutely unforgettable haunted house. Visitor's senses will be heightened and they will take in all sorts of creepy characteristics. If your haunted house is indoors, create a vignette of poisons and other bizarre potions using these apothocary labels. Seeing anything other than your face in a mirror can be a creepy experience. To recreate that concept in your haunted house, take some silver mirror spray paint and coat the inside of a glass frame to 60% opacity. Next, add in a photo of a creepy ghost or face behind the glass. Hide these DIY glowing spooky eyes in bushes, trees, or in windows to make it look like a monster is lurking around your home. To make your own, use a cardboard tube (like a toilet paper roll) and a glow stick. In many cases, writing scary words on the wall in a red blood-like paint will work well. However, if you want to have a darkly lit haunted house, using glow in the dark paint is a much better option. If you're short on ideas on how to make a kid-friendly haunted house, consider ways to make the creepy seem more fun and human. For instance, pose some skeletons in creative ways doing everyday things.